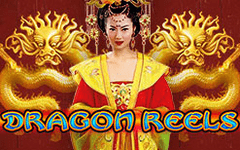 If an online casino pokie developer wants to guarantee success for their newest game, they can’t go wrong with sticking to the theme of ancient China, and that’s just what EGT have done in their Dragon Reels video pokie. Classic symbols of firecrackers, ceremonial drums and smartly-dressed characters are joined on the reels by the high card 9 to A symbols in a Chinese style and, of course, some dragons. These mythical creatures bring good luck to players who land them in the right places, as they trigger wild substitutions and free spins, as well as paying out some of the biggest winnings in the game, while other features include an optional gamble game and a 4-level progressive jackpot round that’s guaranteed to be won when it’s triggered. A red background, covered with white cherry blossoms makes this game look suitably Oriental, and even the reels are subtly patterned with leaves and flowers. Above these, players will notice 4 rising progressive jackpot amounts, each linked to a playing card suit, while below, we see the controls where they need to decide how much to stake per spin. The options range from a low limit of 0.25 to a maximum of 500.00, but there’s free Dragon Reels video pokies at most casinos, which gives people a chance to try it out before committing to real cash games. Landing at least 3 of a symbol type across any of the 25 paylines, on connected reels running from the left side will create a winning combination, and a review of the pay table shows that most of the high card symbols are all worth the same amount, returning 10, 20 or 1200 coins when landing on 3, 4 or 5 reels. The exception is the A, and this symbol is valued at 10, 40 or 200 coins, while higher wins come from the unique picture symbols that give the Dragon Reel video pokie its distinct style. The firecrackers, a paper lantern, the drums, and a Chinese woman are all worth more, and the top wins in normal play come from the Chinese man, who will pay out 10, 100 or 1000 coins when he lands on 3, 4 or 5 reels. A fierce ceremonial dragon really heats things up when it stops across a payline, returning winnings of 180, 1000 and a massive 5000 coins, while also being the game wildcard, able to substitute for others if it can help to complete a winning combination. There’s more dragon-related drama when the golden dragon scatter symbol arrives, landing in any 2 positions to be worth 50 coins, or 100, 1250 and 2500 when landing in 3, 4 or 5 places at once. If 3 or more appeared, once the scatter award is paid, 10 free spins will play out, and during these any wins will be doubled in value. To make it a little easier to get some wins before they end, the wild will also be able to substitute for the scatter symbol, something that it can’t do in the main game. If 3, 4 or 5 scatters appear after any free spin, a further 5 extra games will be added on to the end of any still left in the current round. After any win of 875 or less, players will be invited to enter a double or nothing gamble game, where they will need to predict the colour of a playing card. If they get it right, there’s the option to try and double it again, or collect the new prize, although if they make a wrong pick at any stage the gamble and triggering bet are lost. The randomly awarded Jackpot Cards round is a highlight of all EGT online casino pokie machines and once it starts, the end result will always be a win of any of the 4 Club, Heart, Diamond or Spade progressive prizes. Which one is scooped depends on which 3 matching suits are found first from the 12 face-down playing cards displayed in the jackpot game. While there’s nothing very unique about Dragon Reels, it remains an easy pokie to play and like all EGT games, there’s a decent return to player percentage. Of course, landing some of the high value symbols, or even a progressive jackpot is going to result in some fantastic returns, although players shouldn’t expect to enter the Jackpot Cards game too often. It’s not a mobile-optimised game unfortunately, but other than this, and the fact that some gamblers may not like the usual playing card symbols being used again, this is a good all-round pokie.